Steam from the early morning chill rises off the Green River in the Wind River Range of Wyoming. Squaretop, an aptly named handsome granite mountain in the distance catches the first rays of the sun, rising somewhere I cannot yet see. I sip my scalding, black coffee in our trailer and wait. This is what I do. I get paid to just sit out in some of the wildest places of the world until that unreal moment of light, weather, and circumstance all line up to paint a breathtaking canvas before my eyes. All I have to do is record it on a digital sensor. Well, okay, there is a bit more that goes into it. 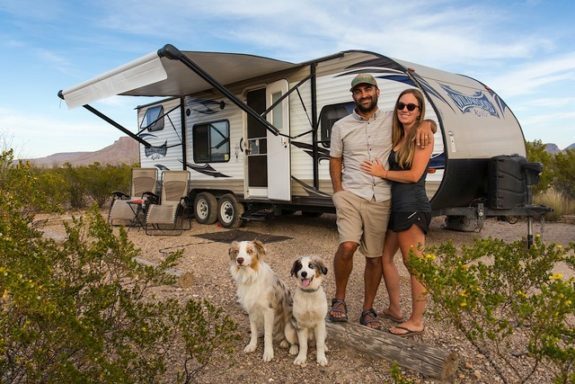 People have asked a lot lately how my wife and I ended up with almost no possessions, living on the road out of a travel trailer, with two Aussie pups and a cat. You can almost see their thoughts reeling: “What is it with these Millennials? Do they have a trust fund? Are they constantly fighting in those tight living quarters?” The truth is we knew there was a simpler life out there– and we craved to know it. My wife Ellen and I, both in our 30s, are at the very front end of a… well, let’s just say interesting generation. We were brought up by boomers in suburban Dallas, Texas. I grew up a nature nerd, spending hours watching National Geographic documentaries and dreaming of far off places while Ellen was climbing trees and playing in the creeks surrounding her neighborhood. Early on, we both developed a strong appreciation for the outdoors. I went on to get a degree in photojournalism from the University of Texas at Austin, and started a decade-plus career as a commercial photographer. Ellen got her degree in Art History, became a certified yoga teacher and worked as a creative consultant to non-profit organizations. Neither of us came from money so we both learned to be scrappy and work really hard. Living in Dallas was going fine; just the usual ups and downs of the freelance life. We had settled into a little duplex near the lake and were traveling about half the month for location shoots when we began to realize that after being back for only a few days, we were ready to head out again for the next adventure. The noise and pace of the city was beginning to wear us down. So one night Ellen had the idea to sell all our stuff, buy a travel trailer, and hit the road full time. Almost none of my work required us to live in Dallas, or any one place for that matter. It would be a total dream come true for us both. We decided to just do it with the objective of spending about five years visiting and photographing in all 59 national parks– a pretty ambitious undertaking. Time, we had, but money was another matter. Life as a roving freelancer is completely feast or famine. That’s why, as a landscape and active lifestyle photographer, I’ve learned to have a multi-pillared approach to my business. There’s my commercial work, editorial work, teaching at workshops, shooting stock and to round it all out marketing fine art prints. The theory is that if any one (or even two) of these revenue streams slows down or dries up, the other two or three can continue to prop us up. Once we finally became full-timers, we felt completely at home. On our inaugural morning in the trailer, I remember waking up, stumbling the four feet over to the dinette for coffee, looking out the window and seeing a bison grazing ten feet away from me. It was glorious. So here we are: almost a year down the road and neither of us have any regrets. Well, I take that back; we only wish we would’ve done this sooner. Our travel quest spawned a fine art print concept that has helped keep us on the road so far. I’ve always loved creating prints. Especially in the darkroom days. For me, it’s a very tangible way of presenting my work to folks who appreciate photography. And it refines my work. Presenting an image on Instagram is one thing but printing it out large is another. For readers who have printed their own photographs, you know what I mean. I typically sell limited edition 12 x18-inch or smaller prints through my web site, output on my faithful Epson 2200. I print on Red River Polar Matte Magna (see Resources) because it is a smooth matte with the heaviest weight on the market. Prints have depth and contrast and they also have a substantial feel to them. They remind me of the old fibre papers of the analog days. I also like Arctic Polar Luster (see Resources) for its heavy weight and incredible color and contrast. I’ve sold more than 250 prints so far, shipping them weekly from wherever we are at the time. Printing on the road gives me another great way to promote and disseminate my work and to generate some extra income. Keeping connected, though, can sometimes be challenging. 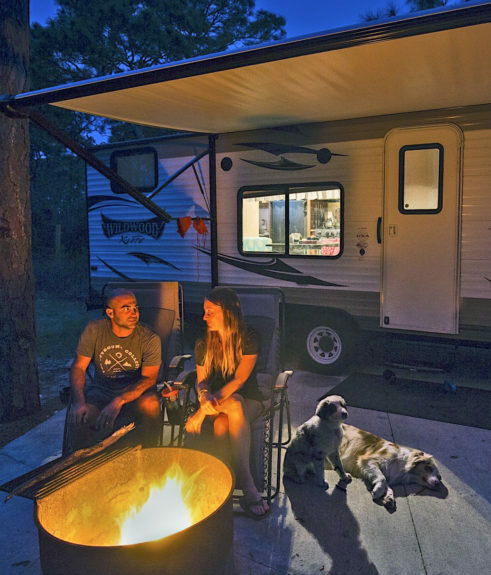 Often, when on the grid at campgrounds, RV parks or cafes we have Wi-Fi, albeit very slow. When we are off the grid, I will create a hotspot from my phone that is often faster than the Wi-Fi we get from campgrounds. And then there are the times that we are so far off the grid, there is no internet or cell service. At times like these we simply enjoy the silence and rest. Before we hit the road, our lives were a bit more, well, all over the place. Ellen was running around the affluent Dallas neighborhoods conducting private yoga sessions for stay-at-home moms and retirees. I was working on corporate and commercial shoots, doing post-production, involved in website upkeep duties and more. Half the month was spent in my dark office staring at a computer, mostly, and staying up late watching television. During the other half, we were traveling, living outdoors, sleeping in a tent, cooking over an open fire, waking up with the sunrise and going to bed when it went down. Now I awake nearly every morning an hour or so before the dawn and let my two girls, Islay and Skye outside to play together. My coffee bubbles on a little three-burner gas stove while Colonel Bubba, our cat, and I sit and enjoy the silence of the pre-dawn. I have previously scouted a location for the morning’s shoot so once I pour the rich, dark elixir into my large travel mug, I kiss Ellen and the girls goodbye, hop into the truck and head out with two Canon 5D Mark III bodies and an arsenal of lenses. Dawn shoots are typically too early for anyone to want to get up for so that means I have the natural beauty of a new day all to myself. I rarely spend this time on my lifestyle, commercial or editorial clients. Morning is “me time.” The rest of the day consists of long hikes, social media computer time, truck and trailer maintenance duties, and afternoon/evening outdoor lifestyle shoots. There’s a lot to learn being full time RVers. And the only way to learn it is as you go. I had a workshop to lead in Yellowstone last summer, so Ellen and I decided to find a nice, secluded spot in the National Forest near West Yellowstone to park our trailer. We set out down a dirt road with our 4×4 truck and 29-foot Forest River travel trailer. We learned an important lesson only a quarter mile down that road: our trailer is not made to do rough, dirt roads. As we worked our way slowly down the dusty, two-track trail, we hit a small bump. Small enough that our four-wheel-drive Ford F-150 didn’t even register it. But it was a seismic disaster for our trailer and it took some time to set it right. Life on the road has also taught me to be a MacGyver, of sorts. We don’t have the money to just take our truck and/or trailer into the shop every time there’s a problem. YouTube and my meager toolbox have become exponentially more valuable to me than I ever imagined they would. I guess the point is, that we are living the dream, but at a cost. And to us, the cost is so minuscule, we feel as though we’ve rigged the game on this one. So how do we do it? Well, it’s pretty simple when I get to the heart of it. We changed our priorities. Dramatically. Now, instead of a mortgage for a nice home, we have a gasoline budget. Instead of working toward retirement, we do what we love so we will never want to retire. My dad never overwhelmed me with a ton of advice. But one thing he told me–and that I have never forgotten–sums up the way I have lived my life: “Do what you love, and the money will come.” Right now all we want out of life is to live simply and be fulfilled. And so far, we feel like the richest people on earth. 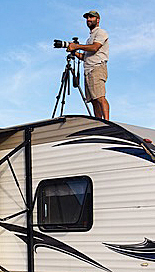 Andrew Slaton is an award-winning photographer who has done assignments for more than 50 clients and specializes in lifestyle and outdoor images. 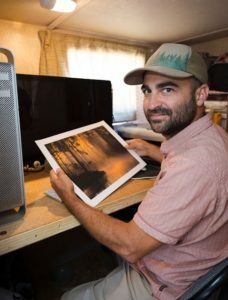 He is a Red River Pro who outputs his National Parks prints in limited editions of ten each, printed on archival Red River papers with fade-resistant pigment inks. Andrew and Ellen will be sharing their adventures with us from time to time. You can help them achieve their goal by adding one or more of his prints to your collection. You can also subscribe to a collector’s edition of prints from each of the 59 National Parks he photographs. 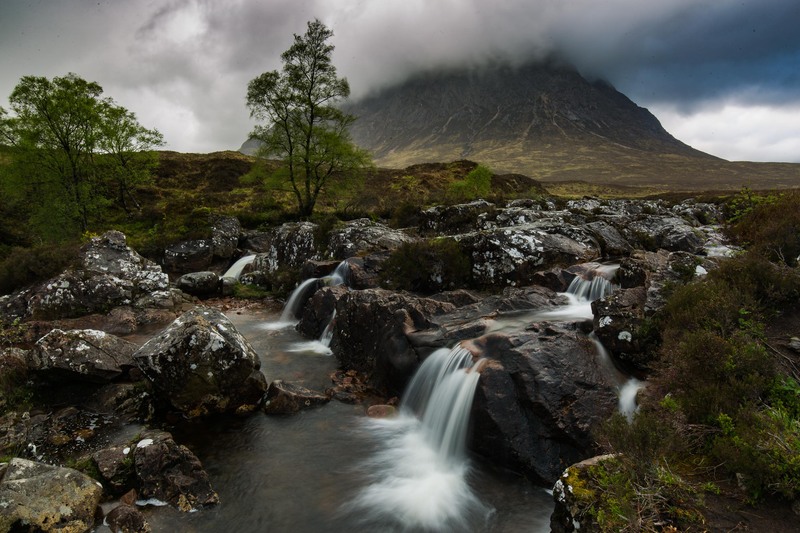 Visit Andrew’s web site and view his work here. Learn about and sign up for one of his future workshops here. See what’s NEW + download your free Grand Teton National Park sample today!